This week, we’ll be featuring a short roundup of some of the events inside and outside of the prison walls during the beginning of the Prisoner Work Strike that started on September 9th in the United Snakes with the goal of ending Prison Slavery in U.S. prisons. 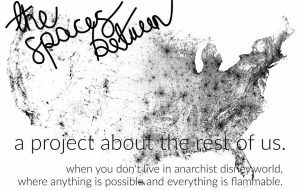 After that we’ll hear the last half hour of Gil O’Teen’s conversation with Guy McGowan Steel Steward, an American anarcho-communist about his joining the Rojava Revolution alongside Kurdish and other folks in Northern Syria. This portion, they discuss nationalism and national identity in Rojava, the draft, the decision to adopt Federalization within Rojava and more. This is within the context of recent Turkish incursions into the Kurdish regions of northern Syria which have led to deaths among civilians and YPG/YPJ forces of the Kurdish Resistance. These deaths include foreign fighters who’ve joined the Rojava struggle. Happily, Guy is not among those dead. There is an interesting discussion and an homage to american anarchist fighter Jordan MacTaggart, an interview with Rojava Solidarity NYC, plus much much more in the latest episode of The Ex-Worker podcast, available at http://crimethinc.com/podcast that I suggest folks check out and share with friends. Some further resources concerning the YJC and YCR. and Osman Evcan, Turkish anarchist prisoner who is starting a new hunger strike. To hear our interview on this matter, visit us here. International Brigade reactions to Turkish aggressions video. And 7 anarchists arrested and accused of being members of FAI. As many of you are probably aware, Friday September 9th kicked off the largest and most coordinated prisoner work stoppage in the US in all history, on the 45th anniversary of the Attica Prison uprising. Organized in conjunction with incarcerated members of the Free Alabama Movement (FAM) and the Incarcerated Workers Organizing Committee (IWOC), this work stoppage is turning a bright spotlight on the continuing condition of slavery in the United States, a slavery upon which this country’s economy is cripplingly dependant. Prisoners are also forced to be responsible for running the actual prisons themselves, working in the laundry, cafeteria, and so on, pretty much in any non-administrative capacity you can think of. I don’t think it should go without saying that much of this labor goes unwaged, though the on average 13 cents an hour that inmates get paid is nothing compared to the exorbitant costs of goods in prison stores. Friday kicked off the actual strike, but resistance from within prison got started well before then with fires being set at Lincoln Correctional Center in Lincoln, Nebraska on September 6th, a 4 dormitory wide riot at Holmes prison in Bonifay, Florida on the 7th which hopped from dorm to dorm in the facility keeping just ahead of the CO’s attempts to quell the rebellion, creating a Whak-A-Mole type situation that I’m sure the prison officials just loved. Also on the 7th inmates at the infamous military detention center Guantanamo Bay remain on hunger strike to protest their indefinite detentions, many of whom were captured as part of the xenophobic and racist governmental response to September 11th, 2001, 15 years ago today. September 9th at noon saw a complete work stoppage at Holman Correctional in Atmore, Alabama where our comrade Michael Kimble is held captive. There is no incidents yet from prison officials, and guards and COs were forced to perform all tasks. Sit down strikes and work stoppages were also held in Bonifay, FL in the aforementioned Holmes Prison, amid the ashes of the fires set only two days prior. In Troy VA, there was a work stoppage at a women’s facility, and all across this state of North Carolina prisoners refused to report to their jobs. At a women’s facility in California 10 or so brave souls refused to work and effectively shut the whole prison down because of fear of a riot. Disturbances were reported at Gulf and Mayo prisons in Florida, and three guards were injured in scuffles at Tecumseh Prison in Nebraska. Yesterday saw a continuation of resistance in Nebraska at a women’s facility, from all over South Carolina, and continuing resistance in Atmore. Solidarity from overseas has been flying in fast and furious, with statements from prisoners in Greece, Australia, Lithuania, and Sweden among many others. Repression of those who are striking has mostly consisted of prison lockdowns and targeting of people who have been designated the “ringleaders”. It will be very important for people to recieve solidarity from those on the outside in order for this resistance to continue. Keep your eyes on itsgoingdown.org and the live updates at http://maskmagazine.com for current info and calls for backup. You can visit the IWOC at iwoc.org for a list of concrete anti-repression tactics to share with those who are incarcerated and otherwise. Now, let’s take a gander at some of the events we were able to find that took place outside of the prison walls, per se, around the U.S. and around the world. A full narrative of outside support events would take a very long time, which is a good thing, so we’re going to read through some highlights starting local to get the attention of the folks locally on this. We’ll be giving precedence to two local struggles in which arrests occurred. If folks from elsewhere have an experience they want to share, send us an email at thefinalstrawradio@riseup.net or add it to the growing lists of solidarity by emailing info@itsgoingdown.org. First off, let’s begin with Western North Carolina. “In the early afternoon of Septmeber 9th, comrades held a banner outside of the Avery Mitchell Correctional Facility in Spruce Pine, North Carolina. This was an attempt to offer support to any of the 816 prisoners at the facility involved in prison functions who may have chosen to withhold their labor as part of the wider strike against prison society. 5 arrests were made and trespassing charges were issued. Later that afternoon in downtown Asheville, and following a #NoDAPL solidarity march and protest at TD Bank, there was a march through downtown in support of striking prisoners. 60-70 folks banged pots and pans, held banners and signs, passed out leaflets and chanted “Brick By Brick, Wall By Wall, We Will Make Your Prisons Fall” and other classics. Police followed the march blaring requests to get out of the street and eventually attempted to push the marchers onto the sidewalk with their vehicles. Attempts to engage the Friday night drum circle into hitting the pavement fell on deaf ears as folks made their way towards the Buncombe County Detention Facility. 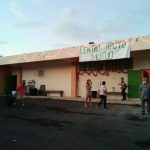 While passing by the local Goombay festival, flyers were distributed and a group of folks backstage answered our chants of “Our Passion for Freedom…” with their own melodious note of “Freedom”. A few minutes later and a few blocks away, 3 of ours were arrested, accused of blocking traffic and one with an additional charge of resisting arrest. By midnight the 3 were out. At moments like these it is so crucial that we support people doing work to sustain the struggle for racial justice & prison abolition. This allows us to create stronger movements where we can all continue to be leaders in these fields and help a build stronger sense of community, especially in the south. We are all in this together and we need to continuously show up for each other, not just in the streets but in ways that allow us to continue to sustain our lives and our passions for the movement. “Today marks the beginning of the national prison strike. Prisoners all over the country are going on strike and refusing to cooperate with the unjust prison system. They are demanding decent pay for work, decent food and living conditions, and an end to inhumane practices like solitary confinement. 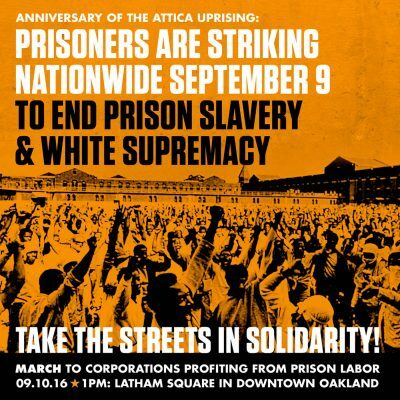 We are working hard to make sure all the protesters get free as soon as possible, so everyone can continue doing the important work of supporting the ongoing prison strike.” As of this morning, Sunday, September 11th (make a wish! ), all defendants are out but are facing some stupidly hefty charges. One demonstrator apparently was taken during their arrest to a police precinct women’s bathroom and choke slammed against the wall for being a part of copwatch in Atlanta. FTP! International solidarity with the strike has been tremendous, with banner drops, graffitti and actions ranging far and wide. Here are a few instances of international solidarity, this is by no means a complete list. You can see more information about this, plus photos and full statements at It’s Going Down. * Horgoš, Serbia: Banner drop in support of prison strike. 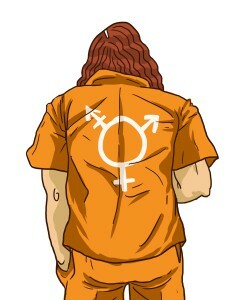 * Brisbane, Australia: Solidarity action with US prisoners. 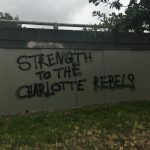 *Melbourne, Australia: Info table with literature about US prisons and the prison strike, along with collected donations. * Melbourne, Australia: Anarchist demonstration outside US Consulate. * Malmö, Sweden: Solidarity demonstration. * Athens, Greece: Demonstration outside Korydallos women’s prison. 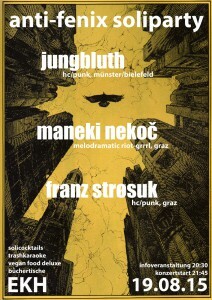 * Leipzig, Germany: Rally outside US Consulate. 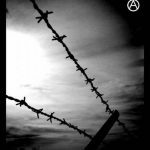 * Montreal, Canada: Dinner and film screening in solidarity with prisoner rebellion. * Melbourne, Australia: Noise demo at youth jail. * Barcelona, Spain: Graffiti messages of support written on McDonald’s. In February 2017, political prisoner Zolo Azania will finally be released from prison. He will have served 35 years, 27 were on death row. During his final year inside, Zolo wants to participate in the Indiana Dept. of Corrections (IDOC) Work Release Program. The IDOC should grant Work Release to Zolo based on the person he is today, his record of good behavior, his re-entry needs, and Indiana’s commitment to rehabilitation. However, the IDOC has denied Work Release for Zolo, apparently based on the fact that he was convicted of murder– 34 years ago.The IDOC’s denial of access to Work Release for Zolo is unfair and unwarranted! in April. If convicted, there is a significant chance Chase could die in prison because of how his imprisonment has compounded the effects of this neurodegenerative disease. and Brent Betterly. They became known as the “NATO 3” after they were targeted by undercover Chicago police and arrested on May 16. The state of Illinois accused the “NATO 3” of making explosives. The Illinois State’s Attorney Office quickly labeled the young men “terrorists” in a criminal complaint and charged them with state terrorism offenses. On February 7, 2014, after a lengthy trial in which the key role of undercover cops became even more apparent, a jury acquitted the “NATO 3” of all terrorism charges. But they were found guilty of arson-related offenses and “mob action” charges. In April 2014, a judge sentenced Church to five years in prison, Betterly to six years, and Chase to eight years for arson offenses. The judge allowed prosecutors to present evidence against Chase related to the alleged aggravated battery incident involving the spraying of urine and feces on a guard, even though the state intended to pursue a separate trial. Betterly, who was released from prison in April 2015, was last with Chase while they were beat up by guards during their arrival at the Stateville prison’s receiving center. After sentencing, they were put on the same bus and moved to the prison. Guards from the Illinois Department of Corrections awaited their arrival, which resulted in a “pretty violent interaction,” according to Betterly. During a recent pretrial hearing on December 7, 2015, Chase showed up to court with a black eye and a swollen face. Betterly said he’s lost a considerable amount of weight, perhaps fifty pounds. Supporters are terribly concerned about his health. Chase is in solitary confinement at the Pontiac Correctional Center, a facility where a number of violent and/or mentally ill inmates are incarcerated. State prosecutors allege that on October 4, 2013, Chase sprayed “human aste” on a Cook County prison guard, Officer Trevor Hapanionek. He was charged with four different charges for one alleged act. usually goes through multiple stages of disability until spending the final 8 years of their life in a nursing home or hospice care. It is hereditary. Chase’s dad died from the disease, and according to Shannon’s best estimate, the onset of Huntington’s disease began in 2008. This week, The Final Straw features content recorded by comrades in France of some reactions and reminiscences on the moments leading up to the death of Remi Fraisse and what followed. Context, Remi was a 21 year old resister who participated in the ZAD du Testet who was killed by a concussion grenade shot by police that exploded at the base of his neck on October the 25th. The ZAD du Testet is a land defence project in southern France against the construction of the Sivens Dam. 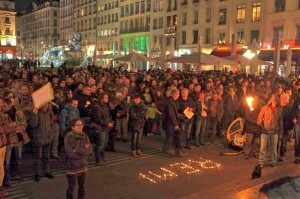 The death of Remi has been marked by protests around France and around the world and has contributed to public discussions about militarization of police in France. 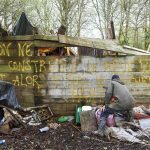 A part of the ZAD movement’s reaction has been a public call for demonstrations on the 22nd of November around the world for Remi and against the police state.